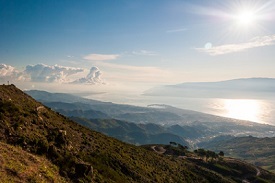 The Strait of Messina is a 20 mile waterway that separates Sicily and Italy on either side. Its shifting currents are the cause of much difficulty for navigating the channel, and in Greek mythology, the rocks and whirlpools were thought to be two female monsters named Scylla and Charybdis. The myths were maintained with the help of the Fata Morgana which is a mirage that causes the appearance of an object onshore to be vertically elongated. The region is also well known for its archaeological remains and historical sites in cities like Messina and Reggio di Calabria.